One of the instructions you may be given in an emergency where hazardous materials may have been released into the atmosphere is to shelter-in-place. This is a precaution aimed to keep you safe while remaining indoors. (This is not the same thing as going to a shelter in case of a storm.) Shelter-in-place means selecting a small, interior room, with no or few windows, and taking refuge there. It does not mean sealing off your entire home or office building. If you are told to shelter-in-place, follow the instructions provided in this Fact Sheet. Why You Might Need to Shelter-in-Place: Chemical, biological, or radiological contaminants may be released accidentally or intentionally into the environment. Should this occur, information will be provided by local authorities on television and radio stations on how to protect you and your family. Because information will most likely be provided on television and radio, it is important to keep a TV or radio on, even during the workday. The important thing is for you to follow instructions of local authorities and know what to do if they advise you to shelter-in-place. Go to an interior room without windows that’s above ground level. In the case of a chemical threat, an above-ground location is preferable because some chemicals are heavier than air, and may seep into basements even if the windows are closed. Close the school. Activate the school’s emergency plan. Follow reverse evacuation procedures to bring students, faculty, and staff indoors. If there are visitors in the building, provide for their safety by asking them to stay – not leave. 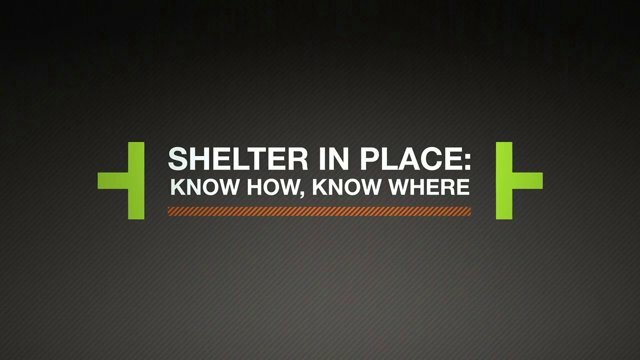 When authorities provide directions to shelter-in-place, they want everyone to take those steps now, where they are, and not drive or walk outdoors. Provide for answering telephone inquiries from concerned parents by having at least one telephone with the school’s listed telephone number available in the room selected to provide shelter for the school secretary, or person designated to answer these calls. This room should also be sealed. There should be a way to communicate among all rooms where people are sheltering-in-place in the school. Ideally, provide for a way to make announcements over the school-wide public address system from the room where the top school official takes shelter. If children have cell phones, allow them to use them to call a parent or guardian to let them know that they have been asked to remain in school until further notice, and that they are safe. If the school has voice mail or an automated attendant, change the recording to indicate that the school is closed, students and staff are remaining in the building until authorities advise that it is safe to leave. Provide directions to close and lock all windows, exterior doors, and any other openings to the outside. If you are told there is danger of explosion, direct that window shades, blinds, or curtains be closed. Select interior room(s) above the ground floor, with the fewest windows or vents. The room(s) should have adequate space for everyone to be able to sit in. Avoid overcrowding by selecting several rooms if necessary. Classrooms may be used if there are no windows or the windows are sealed and can not be opened. Large storage closets, utility rooms, meeting rooms, and even a gymnasium without exterior windows will also work well. Bring everyone into the room. Shut and lock the door. Write down the names of everyone in the room, and call your schools’ designated emergency contact to report who is in the room with you. Listen for an official announcement from school officials via the public address system, and stay where you are until you are told all is safe or you are told to evacuate. Local officials may call for evacuation in specific areas at greatest risk in your community. Turn off the engine. ? Close windows and vents. Local officials on the scene are the best source of information for your particular situation. Following their instructions during and after emergencies regarding sheltering, food, water, and clean up methods is your safest choice.